Invert a large baking sheet and place it on a rack in the lower third of the oven; preheat the oven to 500°. Invert a second baking sheet on a work surface and cover it with a sheet of parchment paper. Stretch the pizza dough to fit the parchment paper. Using the back of a spoon, spread the pesto over the dough. Slide the pizza and the parchment from the cool baking sheet to the hot baking sheet in the oven. Bake until golden, about 12 minutes. 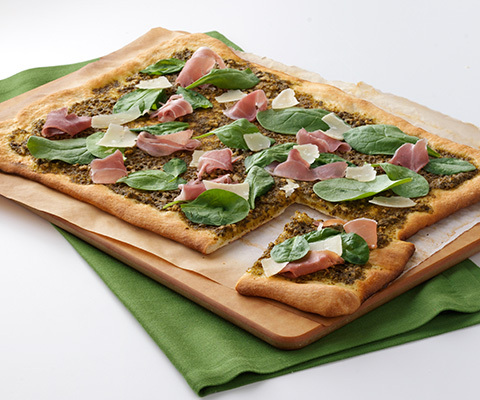 Top with the prosciutto, spinach and parmesan, and cut into pieces.